A recent "Exorcism and Prayer for Liberation" conference in Rome has concluded that with the rise of secularism requests for exorcism have risen dramatically. Exorcism is the ritual of evicting demons or other spiritual entities from a person or an area they are believed to have possessed and for some it evokes images of a past in the Catholic Church when the rite was more common. The call for more trained people to help those dealing with demons came during the April 19 to 24 conference. Fr. Cesar Truqui, an exorcist from the Legionaries of Christ, said that,"Just in the dioceses of Rome, around a third of calls that are received are requests for the services of an exorcist," according to Britiain's Daily Telegraph newspaper. Satan will be fought by resorting to a new "multi-disciplinary" approach to exorcism that includes not only Catholic priests trained in exorcism but also psychiatrists, criminologists, sociologists and doctors, said a press release from the organizers of the conference. "It is not a course to become exorcists. The goal is to offer useful tools to the priests for their pastoral work, information and support for families," said the Regina Apostolorum Pontifical Ateneo Sacerdos and GRIS (Group of Socio-Religious Research and Information), which organized the meeting. "The course offers an insight into the topic of Satanism and sects, which is very useful for priests and lay people interested in these issues," the statement said. "Some episodes chronicle occurred in recent years, should be a wake-up call to take seriously a problem too underestimated the increase in interest in Satanism. Priests and laity, with a solid, can make an important contribution to address this problem, which threatens to involve young people in particular." The conference noted there are only 250 trained exorcists in Italy and just 500 to 600 worldwide, a fraction of the 1.2 billion Catholics. Dioceses have been relentless in their requests to increase the number of trained exorcists. Cardinals in Milan, Turin and Madrid, have increased the number of exorcists in their dioceses to cope with what is being called a surge in demonic possession. Fr. 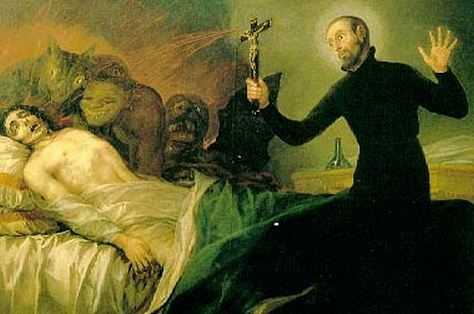 Francesco Bamonte, president of the International Association of Exorcists, was quoted as saying that the rising demand for trained exorcists in Italy is also linked to a growing interest in the occult. Some news reports also noted a large number of young priests and nuns at the conference, especially from Africa and Latin America, keen on pursuing careers in the ministry of exorcism. The conference mostly covered the phenomenon of demonic possession and also paid attention to the specter of Satanism. Both these phenomenon are threats Pope Francis (Jorge Mario Bergoglio) has said are pressing. Vatican insiders, according to The Washington Post, have noted that Pope Francis, despite his image of modernity, is adamant in his belief the Devil does exist and must be fought. Others said the Pope's teachings on Satan are regarded as the most old fashioned of any Pope since Pope Paul VI. Last month during a mass in Rome, the Pope warned those present not to be deceived by the face of Satan hiding in the modern world. "Look out because the Devil is present," said Francis. Some 200 delegates from 33 countries attended the conference that focused on the theoretical and practical implications of the ministry of exorcism.